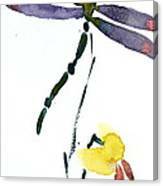 Acacion Dragonfly is a painting by Beverley Harper Tinsley which was uploaded on January 20th, 2013. A glittering deep forest green and amethyst dragonfly hovers between exotic flowers of green gold and copper. The elongated composition with two flowers gives a sense of meditative peace and balance. This simple painting was inspired by asian style art, as part of my interest in learning more about sumi-e, and applying the techniques and brushwork to watercolor paintings. 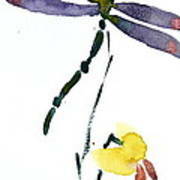 I do also take great joy in watching dragonflies hover, swoop and hunt. In Japan, dragonflies are symbols of courage, strength, and happiness, and they often appear in art and literature, especially haiku. This is not, of course, a traditional sumi-e, or ink wash painting, as I have used watercolor paints and paper, as opposed to ink and rice paper. Truly, it is more inspired by such works. The goal of ink and wash painting is not simply to reproduce the appearance of the subject, but to capture its soul. To paint a horse, the ink wash painting artist must understand its temperament better than its muscles and bones. To paint a flower, there is no need to perfectly match its petals and colors, but it is essential to convey its liveliness and fragrance. East Asian ink wash painting may be regarded as an earliest form of expressionistic art that captures the unseen. East Asian ink wash painting has long inspired modern artists in the West. In his classic book Composition, American artist and educator Arthur Wesley Dow wrote this about ink wash painting: "The painter ...put upon the paper the fewest possible lines and tones; just enough to cause form, texture and effect to be felt. Every brush-touch must be full-charged with meaning, and useless detail eliminated. Put together all the good points in such a method, and you have the qualities of the highest art". Dow's fascination with ink wash painting not only shaped his own approach to art but also helped free many American modernists of the era, including his student Georgia O'Keeffe, from what he called a 'story-telling' approach. Dow strived for harmonic compositions through three elements: line, shading, and color. He advocated practicing with East Asian brushes and ink to develop aesthetic acuity with line and shading. Shading in ink wash painting refers to the varying ink density produced by grinding an ink stick in water. Ink wash painting artists spend years practicing basic brush strokes to refine their brush movement and ink flow. In the hand of a master, a single stroke can produce astonishing variations in tonality, from deep black to silvery gray. Thus, in its original context, shading means more than just dark-light arrangement, it is the basis for the beautiful nuance in tonality unique to East Asian ink wash painting and brush-and-ink calligraphy. According to Sumi-e Society Midwest:The Philosophy of Sumi-e is contrast and harmony, expressing simple beauty and elegance. The Tai Chi diagram demonstrates the perfectly balanced interchange of the two dynamically opposed forces of the Universe, the dot represents integration. The goal of the brush painter is to use the brush with both vitality and restraint. Constantly striving to be a better person because his character and personality come through in his work.nk painting has evolved from the elegant Calligraphy of China. The stroke that forms the character for number one, becomes the trunk and branches for the bamboo tree. If you look closely at the Chinese word for horse, you can see the legs, tail and mane. Thank you Ken, Cheryl and Madalena. So kind.